RVnGO is America's best marketplace to find RVs to rent in Louisiana. Find your RVnGO! 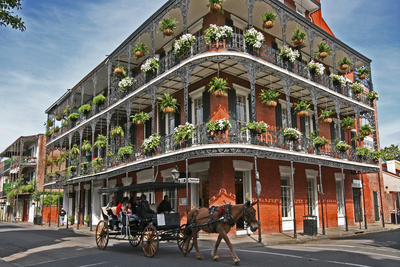 In the core of the French Quarter lies Bourbon Street. This well-known gathering spot is a "grown-up" only place. Clubs and bars line the road, with Louisiana's cherished jazz music spilling out of each entryway. On the off chance that you are not into the club scene, Bourbon Street is still a great place to visit for the food! Pretty much any entryway you enter offers phenomenal dishes of crayfish, etouffee, and gumbo. Don't leave Louisiana without a visit to Cafe Du Monde for a chicory coffee and beignet. If you plan to drive your RV to Baton Rouge you should make a stop at the USS Kidd Veteran Museum Named after Rear Admiral Isaac C. Kidd, the USS Kidd is a Fletcher-class destroyer that is presently sitting on dry ground right in the heart of the city. The veteran's gallery adjoining the late naval force destroyer is filled with memorabilia, exceptional antiques, shows, accumulations, a remembrance divider, and more. The gallery is open most days from 9 am to 5 pm. Heading Layfayetteville way, swing on into Vermilionville for a spell. It is a living history exhibition hall depicting Louisiana's way of life and history. Opened in 1990, Vermilionville highlights an early Acadian settlement utilizing unique structures dating from 1765 to 1890, various displays, a healer's garden, and a craftsman exhibiting their skills in shows and displays. You can either take an independently directed visit or a guided tour around the town. Pick up some gifts for the folks back home at La Boutique. Vermilionville is open Tuesday - Sunday, from 10 am to 4 pm. If you plan on driving your RV rental in Louisiana to Baton Rouge to spend a couple of days exploring the city and surrounding area, your best choice for RV parks is at the Baton Rouge KOA. Similar to KOAs all over the state, Baton Rouge KOA is a family arranged campground full of offices and amenities. It has 54 accessible full hookup spots with porches, tables, and fire rings. Services include wi-fi access, digital TV, swimming pool, whirlpool, play area, recreational lobby, game room, basic supplies, restrooms and showers, laundry rooms, and staffed RV wash for your camper rental in Louisiana. Appreciate the Baton Rouge KOA all through the year. Perfect for a RV trailer rental in Louisiana, Jude Travel Park of New Orleans is the perfect place to dock in New Orleans to explore this extraordinary and fascinating city. It has 31 accessible full hookup spots with space for slideouts. Services include a swimming pool, whirlpool, wi-fi access, digital TV, visitor administrations, restrooms and showers, and laundry room for your RV trailer rental Louisiana. Feel sheltered and secure at Jude Travel Park of New Orleans, open throughout the year. Found only a couple of minutes from Lafayette, Bayou Wilderness RV Resort suits a wide range of RVs and trailer rental in Louisiana. It has 121 accessible full hookup spots with space for slideouts. It is complete with offices and comforts including a swimming pool, play area, fishing, tennis court, open-air games, recreational lobby, horseshoes, wi-fi web access, satellite TV, staple goods, fishing supplies, RV stockpiling and supplies, restrooms and showers, and laundry rooms for your trailer rental Louisiana. Have an incredible time at the Bayou Wilderness RV Resort, open all year long for a RV rental in Louisiana. In addition to the world-renowned Mardi Gras in New Orleans, the state of Louisiana loves to celebrate all types of festivals. Each April in Ponchatoula, also called the "Strawberry Capital of the World," is an event all about strawberries! This three-day occasion includes two music stages, lots of food, activities, games, and fun for the whole family. They promise you will have a BERRY good time at the Ponchatoula Strawberry Festival. The Global Rice Festival is a three-day event showcasing Crowley's huge rice farming business. This yearly celebration was created around 80 years ago and happens each October. Everybody is welcome to go to one of southwest Louisiana's greatest gatherings! It includes live games, skill expos, cooking challenges, rice tasting, 5K walk/run, a great auto appear, a senior resident's ball, a fabulous and kids' parade, rice eating challenge, frog derby, a family fun day. With a plethora to appreciate in Louisiana, even experienced tourists can't get enough of it. Lease a RV to Louisiana at RVnGO and explore the Pelican State!